Her name is "Princess Pebble." The miniature horse was found abandoned outside Nashville. NASHVILLE, Tenn. — Her name is "Princess Pebble." The miniature horse was found abandoned outside Nashville. "She just eats off of people's lawns and she’s almost crippled because of her condition," said Ellie Laks, Founder of The Gentle Barn TN. "I just want to cry. I just want to make this right for her." The non-profit organization, founded in 1999, serves as a sanctuary and place of recovery for severely abused animals and children. 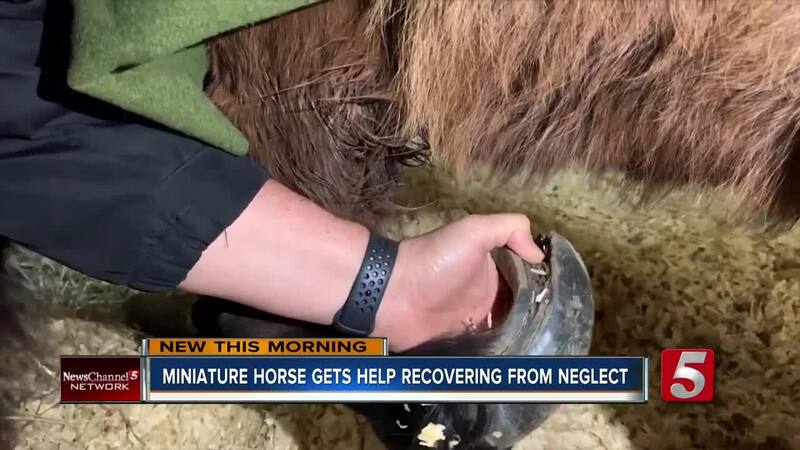 "We were actually at our Gentle Barn Missouri location and I got a text from a local Nashvillian who said that they were visiting someone in their neighborhood and this horse could barely walk because her hooves were so overgrown," said Laks, "They sent us a picture and a video. We were just devastated. Jumped in the car, drove here right away so we could help her." The pictures and video are hard to look at. Laks says at first she feels anger for the abused. "But then seconds afterwards my second reaction is 'let's do something about it so I don’t have to feel helpless. I don’t have to feel angry. Let’s just do something about it,'" she said. Now -- just weeks after years of pain -- Princess Pebble is living her best life. "She's so happy now. She’s not in excruciating pain. She’s not lonely. We groom her and brush her every single day. She doesn’t have to struggle to eat. She’s got plenty of food," she said. Laks says for such a tiny horse, Pebble already has made a huge impact.